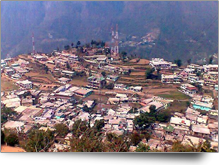 Gopehswar is situated at an elevation of 1308 m above sea-level in Chamoli District. It is a picturesque place located on the Ukhimath-Chamoli highway. An ancient temple of Lord Shiva is the main attraction of the town and thousands of pilgrims come here throughout the year to visit the temple. One can visit Gopeshwar while travelling from Kedarnath to Badrinath. Many tourists also take halt at Gopeshwar during theirChar Dham Yatra. There are many options for accommodation in Gopeshwar during Char Dham Yatra. Following is the list of hotels, resorts, guest houses in Gopeshwar.